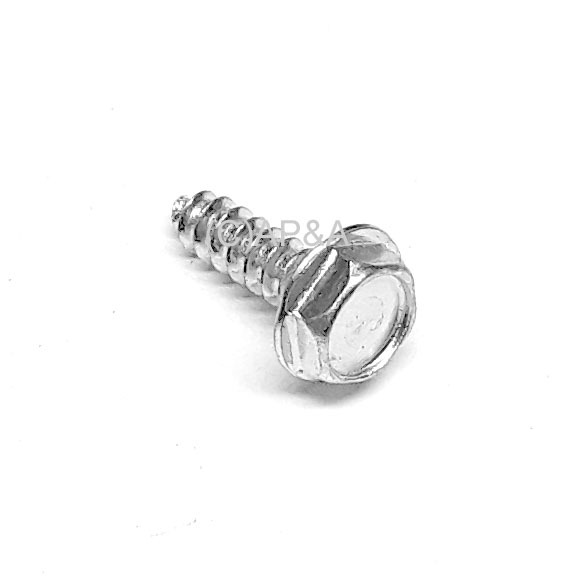 1/2-inch long hex washer head screw with wood thread (SMS). #6 diameter. Uses 1/4-inch socket driver for installation/removal. This is the smaller of the two types of SMS hex-washer-head wood screws used on most games from late 1970s on up. Commonly used to hold down playfield hardware (on top and bottom side of playfield) including lamp sockets, coil brackets, flipper baseplates, playfield plastics, wireform ramps, and most other hardware. Correct replacement for original parts with NO slot in the head. Great replacement for Phillips or flat-blade screwdriver head screws in older games, too! Replacement for Bally/Williams #s 4106-01114-08 & 4106-01115-08, Data East / Sega / Stern #s 234-5001-02 & 237-5809-00, and similar others. NOTE: If you have a stripped-out hole, or need a stronger fit, try using a larger #8 screw.